Byzantine, Texas: Should we be giving Catholics our relics? Should we be giving Catholics our relics? Moscow, September 16 (Interfax) - The head of the Roman Catholic Church received a gift from Patriarch Kirill of Moscow and All Russia - a part of the relics of St. Seraphim of Sarov in a shrine made in the form of an easter egg. Head of the Synodal Department for External Church Relations Metropolitan Hilarion of Volokolamsk conveyed the gift on Thursday at the Apostolic Palace, in the Vatican, the DECR communication service reports. Among the focuses of the talk was the tragic situation of the Christian population of the Middle East. Pope Francis and Metropolitan Hilarion pointed to the positive experience of cooperation in giving aid to Christians in the Middle East in pursuance of the decision made at the meeting in Cuba. "The both sides stressed the need for further consolidated actions in the Middle East. The DECR chairman introduced the Pope to the Russian Church’s initiatives for bringing humanitarian aid to suffering people in Syria and thanked the Pontiff for his peacemaking efforts," the message reads. The sides noted the fruitful cooperation between the Russian Orthodox Church and the Roman Catholic Church in the field of culture. Thus, in the last year a project for exchanging academic trips by priests and theological students from the Roman Catholic Church and the Moscow Patriarchate to Moscow and Rome respectively has proved to hold much promise as an opportunity for a deeper introduction to the traditions and today’s life of the two Churches. Metropolitan Hilarion also met with the Vatican State Secretary Pietro Cardinal Parolin. They agreed that it was necessary to continue the peacemaking efforts aimed at overcoming the conflict, in compliance with the Joint Declaration signed in Havana inviting “Churches in Ukraine to work towards social harmony”. Metropolitan Hilarion has arrived in Italy to the 14th plenary session of the Joint Commission for Theological Dialogue between the Orthodox Church and the Roman Catholic Church. The session will be held from September 15 to 22 in Chieti. Please accept my apologies in advance and forgive any ignorance shown in asking the following: what is wrong with giving relics of Orthodox saints to Catholics? Well apparently the Russian Church sees no problem with it. One might say relics of the Church should stay in the Church. Since the Saints belong to the Lord...wouldn't it make sense that such relics can be properly honored & venerated by both Orthodox & Catholics, each of whom recognize relics as inspiring & powerful treasures of faith? If our ecclesiology allowed for the Catholic sister church idea: yes. As it is (and was highlighted in the recent Crete event) the Church properly doesn't call any body outside a "Church" and they decided to just stick with the term because it would be too cumbersome to make up some new term. Then again, the very group (the Russian Church) who would have most ardently pushed for that understanding is the one that gave the Pope of Rome relics of a post-schism saint. FWIW, the version of the story currently on the Interfax website has a different picture from the one shown with the post. The new picture shows Pope Francis venerating the icon. As a rule or principle of ecclesiology, theology, spirituality, etc. the answer to the question "Should we be giving Catholics our relics?" has to be no. In fact, the answer is pretty obvious - not giving "pearls to swine" and all that - though this is the modern era and no doubt someone here will post some tortured reasoning based on the strange observation that if you don't give pearls to the swine you are being "unloving". I didn't have an immediate visceral reaction to this as many people did, after all, I've given icons to non-Orthodox family members (who I knew would treat them with respect) in the hope that seeing them, they'd feel a pull towards Orthodoxy (and this has largely been the case. Having an icon in the house makes Orthodoxy present in a way most people in the West never experience). My question is not only why would WE do this, but why would the Catholics want a relic of a strictly Orthodox saint like Seraphim of Sarov? They have their own procedures for canonization, as we've heard about with Mother Theresa recently. 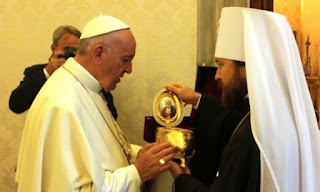 Conversely, what would Patriarch Kirill do if someone gave him a relic of Mother Theresa? He can't venerate it after all, she's not a saint to us. In the end, I imagine this event is more political than ecclesiastical. Patriarch Kirill's meetings (directly or indirectly) are something, I believe, done to aid Russia, to emphasize that we here are not isolated from the world community. Within Russia, Patriarch Kirill is very different. I think this is just a show. I don't think this is expressly linked to the "sister church" idea, because that's a specific terminology under a larger ecclesiological umbrella of acknowledging grace in the sacraments of other particular churches. That ecclesiology is certainly acceptable within Orthodoxy, and in fact I'd say it's the majority view among our hierarchs and theologians. I don't know what an ecclesiological umbrella is but I want one. This agreement takes advantage of those naive Orthodox who have been insisting that they are a “sister” Church of a Vatican “sister” Church, as though glorification (theosis) can have a sister otherwise than Herself. 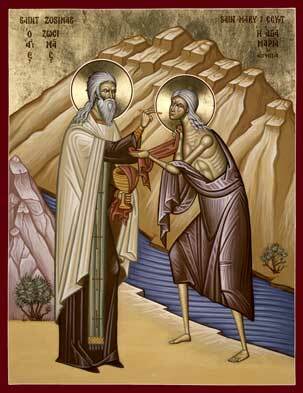 Eastern Rite Catholics venerate Seraphim of Sarov. I have seen an icon of Seraphim at a Latin Rite church. St Sergius of Radonezh is in the Martyrologium Romanus. The Latins are more open to EO saints than the other way round. I don't think giving the Pope a relic of Seraphim is a bad thing. 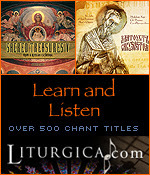 Relics contain grace, why not share it? I can't make a PDF of a relic or the Eucharist. I also share the gospel as a path towards the Church, I wouldn't take the Gospel out of the altar and hand it over to a visitor to keep. It seems to me that relics fall into kind of a grey area between the Eucharist and the Gospel. 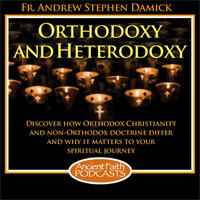 Orthodox and Catholics don't share intercommunion, but they certainly have the same gospel. Maybe relics are kind of like holy water? If I give a Catholic some Orthodox holy water is that ok? Also, historically there's been a longstanding tradition of sharing relics between particular Orthodox churches...even though these particular Orthodox churches do not share a unity of belief in all things. Similarly, Catholics and Orthodox don't share all their beliefs, even to the extent that there is schism between them. However, they do share a belief in the power of God through relics. Perhaps that should be the standard? So, no relic-sharing with Protestants but it's ok with Copts and Catholics? "Orthodox and Catholics don't share intercommunion, but they certainly have the same gospel"
Where is the big red buzzer when you need one? Such a sentence only makes sense in the worst corners of "ecumenism" - it assumes the worst of nominalistic pseudo protestant "theology". No, there are REAL and non-trivial differences between the Gospel as preached and lived in Orthodoxy and the other "churches" and confessions. No, the division between he churches are not nominal - the unfortunate result of historical circumstances and everyday sin but with the important core of "the Gospel" still intact. "At first glance, the phrase 'full/partial communion' is not an easy one to understand. Nonetheless, it is quite traditional (ad mentem patrum or kata to paterikon phronema)." He continues to explain this in a footnote: "Mark (aka the Ephesine), in his opening conciliar speech, asserted to Pope Eugene IV: 'Today, the [Byzantine and Latin] members of the Lord's Body, formerly broken apart and forcibly divided for quite a time, make eager haste toward union with one another.' See Mark Eugenicus, Oration to Eugenius IV, in Marci Eugenici Metropolitae Ephesi opera anti-unionistica, Concilium Florentium Documenta et Scriptores Series A, ed. L. Petit (Rome: Pontificial Institute of Oriental Studies, 1977), 10.1: 28. Hence the Ephesine saw the Latins in partial communion with the Greeks (at the time). For Mark, only after several demonstrations of bad faith, did he definitively separate communion and denominate Latins 'heretics.'" We should also add that the "glorious Patriarch" Gennadios II Scholarios (St. Velimirović's words, not mine), whose Orthodoxy St. Mark of Ephesus believed in so firmly as to entrust to him the anti-union effort, decreed that Latin and Armenian pilgrims to the Holy Land should be treated as schismatics, not heretics (in his letter to Maximos Sophianos). In the same letter he says that although Latins must be refused communion, they can still receive antidoron and blessings from Orthodox priests. Tradition for the win! Thanks, George. "I'd add that the idea that one is or is not part of the Church is not really as obviously Orthodox as some make it out to be..."
You could throw in St. 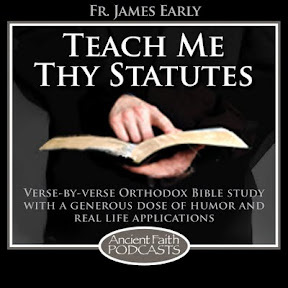 Basil the Great, who had a lifelong habit (both pragmatic and "theologically") of bending over backwards (and remaining in communion with) not only schismatics, but what subsequently the Church defined as "heretics" in that oh so "dogmatic" way.